The business of building patient engagement applications has emerged from one simple idea: if treatment plans don’t stick, patients stay sick. Digital media excels at grabbing attention. As digital attention spans shorten and competition for attention increases, we asked one UX expert how to keep users focused on their health goals long enough to make a difference. UX design to the rescue! So how can we better meet the needs of individual patients and providers? We asked resident UX expert at Ayogo Kelsey Hemphill (a recent finalist for the Vancouver User Experience Awards), about her approach to designing for healthcare. Here are the top three things she considers during the design process to ensure a great patient experience. What information do patients need? When? Too much information at once is overwhelming. Too little information and the tool becomes useless. In either case, the user’s attention is lost. When we design a product at Ayogo, we first seek to understand the patient experience. Each condition has different challenges. It’s important to note patient needs, motivations and barriers, so that we can balance them with client goals. To do this effectively I use systems thinking frameworks, conduct one-on-one interviews, create user journeys, and employ data analytics software. Modeling the system from different perspectives helps me evaluate ideas. It gives me confidence that the features I plan to design are the right ones to implement. Frameworks like this Mental Model help us determine what is important to users and why, helping us decide on features. 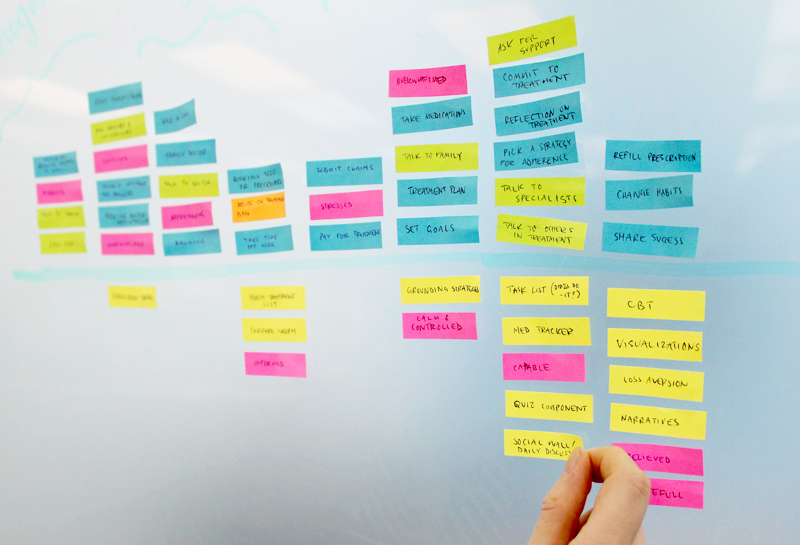 To design a feature, I follow a process of card sorting, flow-charting, site mapping, and wireframing. This helps me uncover the correct structure for a tool; ensuring that I’m presenting the user with the right information. Testing features as we design allows us to refine and iterate until each flow is as intuitive as possible. Prototyping tools save the team from spending valuable development time changing designs that have been built in code. This is an example of a low-fi interaction prototype, created to show how elements on the screen will react to the user as they move through the application. How a patient feels when using a digital theraputic is extremely important. Patients can be motivated to take on more difficult challenges when they feel supported. The addition of “delightful moments” during repetitive tasks can keep them from dropping a tool. This model demonstrates system complexity as it relates to user skill or knowledge. Well designed systems keep users engaged by keeping them in the flow channel, only increasing challenge as skills are taught and mastered. Appropriate colors and cleanly organized content keeps users comfortable. Interaction design helps them remember where they are in the application. They understand each screen at a glance and master skills faster when the consequences of their actions are clear. Clear expectations = comfort. Purposely introducing a little bit of tension—to be resolved at just the right time — is one of the surprising secrets of true engagement. An obstacle placed in the way of achieving a task can deepen interest and build what we call “player investment”. 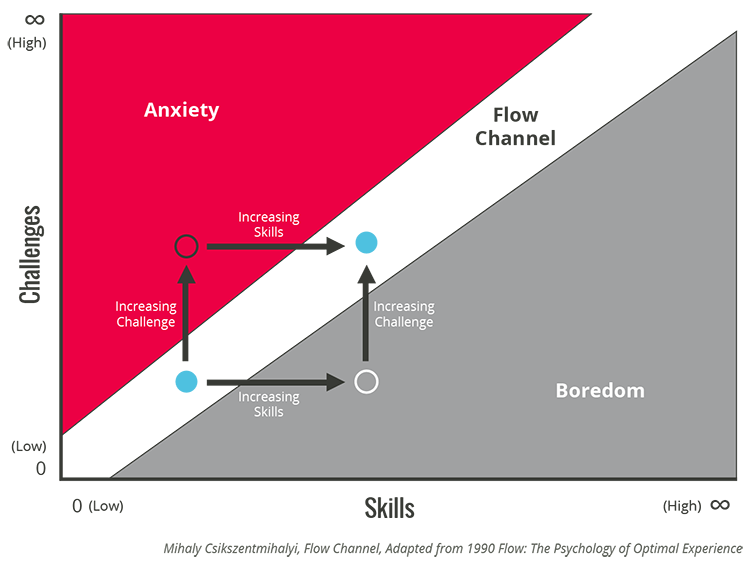 Challenge and investment are part of true gamification, a topic explored further in this great post. Our researchers, writers, and designers take time to listen. If we can empathize with the patient experience, we can break treatment tasks down into manageable pieces. In our technology, we communicate the tasks and goals with clarity and empathy. This supported scaffolding helps patients learn and master skills. Giving users the control to weave a treatment tool into their lives is the difference between a plan that sticks and one that does not. At Ayogo, we ask users to identify and build adherence strategies onto their existing habits. I trust our users to learn and adapt to our applications, but believe equally that our applications need to respond and adapt to our users. People who feel connected socially consistently have more success on the journey towards health. Even with a solid support system, it’s very common to feel isolated when dealing with a medical condition. Addressing this isn’t about throwing a “like” button into a design. It’s about better communication and stronger relationships. It’s about seeing evidence that your experiences are shared by others, or about helping others work through challenges that you were able to overcome. Digital tools should augment our natural social connections, not impede or cheapen them. If our goal is to create treatment plans that integrate seamlessly into the lives of patients and providers, we must first invest the time to understand the people that use them. Only then can we design effective and empowering digital tools. Terminology may change, but the fundamentals of UX are timeless. Are you interested in doing your best work and changing the world? See our current job openings and apply today!